This article reviews the Walt Disney World subdivision that is located near Walt Disney World Resort in Bay Lake and Lake Buena Vista, Florida. Walt Disney World is located approximately 12 to 19 miles southwest of Orlando, Florida. There are actually two subdivisions that Disney invented. The main Walt Disney subdivisions that were created by The Walt Disney Company are Celebration and Golden Oak. Both subdivisions are covered at the middle of this article. The term subdivision refers to dividing a larger parcel into smaller units. When a land owner subdivides a parcel of land, they usually do so to create a new development. The Walt Disney Company, formerly Walt Disney Productions, has subdivided some of their Walt Disney World land holdings. Walt Disney World currently encompasses over 25,000 acres, which was originally over 27,000 acres when Walt Disney, along with Roy O. Disney, unveiled their Florida project to the public on November 15th, 1965. After building their land holdings in Florida, Walt Disney and Walt Disney Productions was able to get a special exemption from the State of Florida to create a new development/improvement district that encompassed their land. Florida allowed the creation of the Reedy Creek Improvement District (RCID), which allowed Disney to have their own “city” (actually cities) and development area. Bay Lake and Reedy Creek, now Lake Buena Vista, were two cities that were created inside the development district. Reedy Creek operates like a city/county that The Walt Disney Company informally controls as a majority landowner. This gives the company flexibility to develop land in house. Walt Disney Productions’ request for the creation of the Reedy Creek Improvement District was also based on the fact that Walt Disney wanted to create EPCOT, the Experimental Community of Tomorrow. EPCOT was a new concept community created by Walt Disney to test out new ideas and enhance innovation around cities. The Epcot that was built in the 1980s is not exactly the original idea that Mr. Walt Disney had, however, it is a collection of some of his ideas. The Walt Disney Company has created two subdivisions for residential housing from their land holdings, Celebration and Golden Oak. Both of these “subdivisions”, which are actually like cities, are not part of the Reedy Creek Improvement District. Both subdivisions were “subdivided” or removed from Reedy Creek and designated as separate areas outside of the district. The first development that was created out of land in the district was Celebration. The official name of the subdivision is Celebration Village and homes have an official subdivision of Celebration Village Unit “#”, where the # is the unit number. Above map by NavFile. Base Map by OpenStreet Map Contributors. Celebration was created by The Walt Disney Company in 1994 and is located to the south / southeast of ESPN World Wide of Sports. Celebration was created by the company to create a Disney town / development. The Celebration Company was the entity created by Disney to manage the creation of the town. Celebration is a “town”, actually a community, that is separate from The Walt Disney Company. The company maintains some control over Celebration, as it provides services to the town and owns land within and around the subdivision. The Celebration area has been fully developed with homes, shops, businesses and a downtown area. The Celebration Walt Disney subdivision is 9.1 miles from the Magic Kingdom and 7.5 miles away from Epcot. Celebration is located inside of Osceola County. Golden Oak was created by Disney and Four Seasons Orlando Resort in 2011 as a new residential development. Four Seasons seems to be the main manager of the development and is licensing the Disney brand for the project. This Walt Disney subdivision is located to the north of Epcot and features two different developments. In 2015 Golden Oak added an additional community within its project, the Four Seasons Private Residences. Golden Oak at Walt Disney World and Four Seasons Private Residences are more closely linked to Walt Disney World, as the company has created the subdivision with special features and amenities. In addition to the special features and amenities, the development is very close to Epcot. Also, the Magic Kingdom is only 4 miles away from the development. In comparison to Celebration, Golden Oak is more like a residential development that a home builder would create. Celebration is a full town, while Golden Oak has fewer home sites and is more focused on features, benefits, and proximity to Walt Disney World Resort. The subdivision for Golden Oak is called “Golden Oak Phase (#)”. Above Golden Oak Walt Disney World Subdivision map by NavFile. Base Map by OpenStreet Map Contributors. Also, the golf course and much of area to the north is inside of the RCID and is officially in Bay Lake, Florida. Golden Oak is closely linked with the Four Seasons Orlando Resort. The Four Seasons Hotel is located inside of the Golden Oak subdivision. 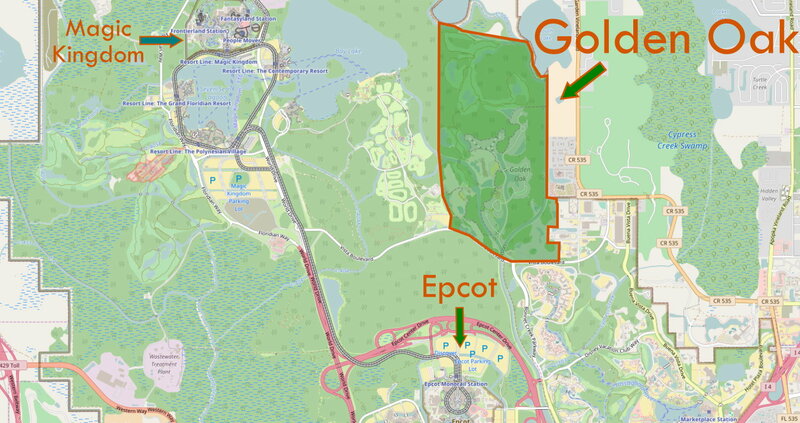 Future developments within Walt Disney World Resort may be rare because the Reedy Creek Improvement District can only remove areas that are on its borders. 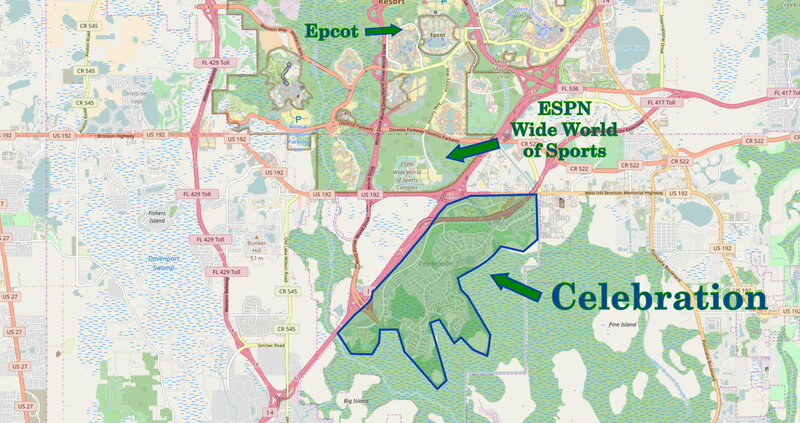 The Celebration and Golden Oak Disney subdivisions are all located at the edge of Walt Disney World Resort. Both of these towns/cities will be covered in more detail in the future. In addition to the Walt Disney Subdivisions covered in this article, there are other developments that surround Walt Disney World. Those subdivisions will be featured at a later date also. David Aughinbaugh II contributed to this article. In addition to being NavFile’s Chief Research Strategist, David is a Florida Real Estate Agent with Real Pro Net / Weichert, Realtors Hallmark Properties. David can help with the purchase, sale, and lease of property in Golden Oak and Celebration, Florida. If you need assistance with real estate, you can learn more about David and contact him on his website here.